Kingsport, Tennessee is probably the last place that you would believe the world's fastest 8k is run. This is NASCAR and football country. Distance running, as a spectator sport, is practically dead in the U.S. It's written off as boring. Dominated by nameless Africans. We are told again and again that it lacks the violence and commercial breaks necessary to be interesting for the American fan. But race director Hank Brown has somehow figured out a way to bring out the whole town of Kingsport to watch these nameless Africans fly around the streets of this small northeast Tennessee town. Crazy 8s is a night race, with a start time of 9:58pm, so it's either stay the night after the race in Kingsport or drive back in the early hours of the morning. Though I am nowhere near the level of the truly elite runners in this race, the race was kind enough to give me a hotel room and free entry for the race. The accommodations were far from luxurious, and the hotel was mostly empty except for me, my wife, and the 20 or so runners from Kenya, Morocco, Ethiopia, and Uganda that would be racing that night. Hanging out in the hotel provided a brief window into the world of these runners. It's certainly not a glamorous life. As far as I could tell, they spent the day exactly as I did: lounging in their hotel rooms, watching tv and fiddling with their phones, trying to conserve energy. They had all gathered for a chance at an unusually deep prize purse: the winner would receive $5000, and 2nd through 8th would also receive money: $2500, $1500, $1000, $800, $600, $400, and $200. But of course, this meant that the other 12 guys would receive nothing. The winner would receive enough money to fund his training for perhaps 4 or 6 months? Who knows? The runners also had agents, who I assume would take a percentage. This was no free lunch. In order to win the $5000 the Ethiopian winner Tilahun Regassa would have to run 22:15, 12 seconds off the world record -- a stunning 4:29 pace. Kenyan Shadrack Kosgei was second in 22:28, while former NCAA champion and Liberty University product -- and current Nike OTC member -- Sam Chelanga arrived third in 22:33. The first runner out of the money? Patrick Chiptoek. He could only manage 4:41 pace -- 23:11 for 8k. That earned him 9th place.The man that outkicked him for 23:10, Birhanu Gedafa, would win $200. How long would that money last? Running is not an easy way to earn a living. Having all of these great runners show up creates a great atmosphere for racing. Before the start, I ran strides right beside them. I recognized Chelanga's Nike OTC jersey, and wished him luck. He slapped me five, and we headed toward the line. While the anthem was played and a Christian prayer intoned (we were in Kingsport, after all), I stood on the line packed in behind some of the very best nameless runners in the world. When the gun fired, they were off instantly. They pulled the rest of the field out in a blur down the first straightaway. Everyone was excited -- there were kids and grandmothers and all kinds of people sprinting in front of me. I let myself be carried along, as I wanted an aggressive start myself. I had come with my own mission in mind. Not to challenge these incredible Africans, but to chase a ghost from previous life. The last time I ran this race was 16 years ago, at age 19. I was really fit then, coming off my first summer as a college runner. I ran 26:07. I knew that it would be tough to beat that mark, but I figured I ought to give it a good swing. It would require 5:14 pace. My best recent 5ks had been run at about 5:05 pace, but they were on the track, and I had actually done some specific training for them, so I knew it was unlikely. Still, I had run well lately, and thought why not give myself a chance to surprise myself. After 400m or so, the race settled out -- the elites were already way out front, cruising. I settled down into an aggressive rhythm. We careened through neighborhood streets lined with candles, and everyone was sitting out on the sidewalk in lawn chairs, drinking beer and enjoying the show. The darkness made it a little hard to judge pace, but I was happy to see the mile marker swing into view earlier than expected. Out in 5:11. I was running by myself, but there was a pack about 10s up on me that had come through the mile in 5:00. I focused on them, hoping one or two would crack and I would have some folks to run with. Here I am, just after finishing. The second mile was a blur -- more neighborhoods, some hippies beating a fast rhythm on bongo drums -- I still felt good and hit two miles at the top of a little hill in 10:25. I had even made a little progress on the group in front of me. The next two miles, though, I would pay for my aggressive start, as they were long and generally uphill. Halfway through the race, we came by the starting line, and my wife's cheers perked me up a bit, but I was starting to fade into the negativity of the middle of the race. I knew I was running too slow to beat my former 19 year old self, but I took solace in the fact that the group in front of me was fading, too. The third mile was 16:00 -- a 5:35. In the fourth mile, I caught one runner who had dropped off the pack in front of me, which gave me a little burst, but I was suffering pretty good. So much so that I don't remember much about this mile, other than just trying to avoid negative thoughts and trying to keep from slowing down. The mile markers that had come so quickly early in the race, now seemed like they would never come. This mile was almost entirely uphill, and I hit the marker in 21:35, another 5:35. Fortunately, just after that marker, the course rolled back downhill and towards the main crowd. I got back into a little bit quicker rhythm and tried to relax and enjoy the rest of the race. I was already well beaten by the ghost of my former self, but I could still finish strong, maybe under 27:00... down the final stretch, we turned up a little rise, into the stadium and into the long finish chute lined with spectators. I watched the clock turn just to 27 minutes as I crossed the line. Final time of 27:01, 33rd place. Not quite what I wanted, but not so bad either for a July race in the middle of summer training. I felt fit, but it was hard to hold onto the fast pace that I wanted. I hope I am fit enough 16 years from now to take a shot at that time! Either way, I definitely want to come back to this race -- and more than once every 16 years. It really is perfect for fast running. I love the night start, and the atmosphere of the race is great for running fast. I wasn't really ready for the climbs over the second half of the course, but that probably had more to do with going out fast than anything else. Finally, one thing that was really striking was the contrasts and commonalities between the folks of Kingsport and the African runners that had been brought in to run. If a race can be successful here, it seems like it would be easy to draw spectators in any town. I thought also about the fact that these African runners--many of whom didn't speak English--ended up in this small town. What did the Kingsport people think of them? Does an event like this lead to more understanding between America and Africa or less? Watching these truly elite runners cruise through the city it's impossible not to notice how deeply different they are than the people watching them, almost as if they are an alien life form. Is it this that provides the spectacle of the race? Is that a bad thing? I'm not sure what the answers are to these questions. Then, there are questions from the other side: how can these runners possibly stretch their winnings into a way of life that extends beyond the 5 years or so that they compete? What's the end game for these runners? What will they do when their racing days are over? How will they remember Kingsport? Just as another hotel, another race? I do know that it was really cool to run behind these runners, and I could feel the energy that their talent injected into the race. I wish that there was more opportunity for these amazing athletes to earn a living and to compete on a more regular basis. I know that the influx of African runners has, in part, diminished the road racing scene because it makes it so difficult for American born runners to win (the first American finisher was Christopher Clark, a Zap runner, who ran 23:58), but their greatness as runners is so obvious that it seems to me to transcend questions of nationality or race. At any rate, I think that Crazy 8s is a great model for racing, and I hope that more RDs will follow suit, thinking of a race not just as an event for runners, but as an event for the whole community. Recruiting tremendous athletes like Regassa and Chelanga can bring an energy to the event that is infectious. You were in America.... After all. That was something, on the fourth mile (uphill), matching your third mile split. Tells me you ran smart when you had to (1-3) and with guts in the closing miles (4, 5). I remember meeting an East African runner, the winner, at the Newport 10,000 in Jersey City, New Jersey. He was living in PA and just getting by. I wondered the same things about him and the $2,000 he would take home. It is tough. It makes me appreciate that this is a hobby for me! I enjoyed this race report and it sounds like a fun race for runners of all kinds. It also sounds like you knew in advance how you'd stack up against your old self this time--doesn't mean you can't beat him next year with *slightly* more of a focus on this race by itself. As for why anyone wouldn't want to watch and be awed by the Africans...I don't get it. They make me proud to be human and only enrich the races in this country and everywhere else in which they take part. I'm proud to finish (way) behind them (unlike you, who are (much less) behind them). Hi Terzah, thanks for the comment! Another great write up as usual, this year and last year were some of the first years I have ever missed watching or particpating in the race. I can say as a young runner I was in awe of the elite runners and we used to calculate out their splits by track times as in many cases they were faster than what our track team was running. Also, it has been a superbly managed race Hank Brown has been an endless advocate for running in EAst TN for years. He has also been heavly involved with the State of Franklin track club that orgainizes local events. I always get caught up in the spectacle of the race every time I run it and am notorious for putting down obnoxious opening miles then tanking. However, something about that spectacle always pushed me to peform. The new ending is rather epic although I wonder with two right angles in short succesion before the stadium if the record will be broken. It's not an easy course, with the long hill at mile 3-4, and then the quick uphill to the finish. It's a fair course, certainly, and the first two miles get you out quick. Thanks for your thoughts and comments, as always. Enjoyed watching that - thanks Jeff. It's a beautiful thing to see runners of that level running in a community event. Quite a contrast between the leader's smooth stride and his gritted teeth. Running at WR pace is obviously not easy. I'd vote for more events of that type too (with bigger sponsors and more money for the pros) - I like your points about the advantages of an evening race. It'd also be more convenient to shut down roads out of business hours. As to your own race - 54 secs over 8k isn't far off your younger self. Worth chasing that target over the next few years. Great race report. I also think this is exactly like a race I just ran this past weekend in Maryland. 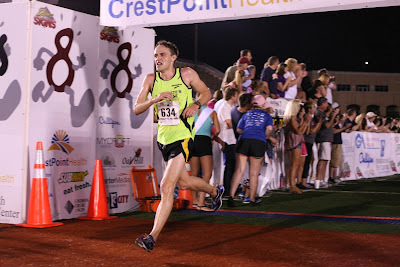 The Rockville Twilight 8K, 8:45PM start, deep, deep field, and decent prize money for the top 5. Lots of spectators too. I finished in 26:56 for 41st overall. Could have also gotten in as a "weak elite" but didn't know about! These highly competitive twilight races are a really awesome experience. Sounds like we need to hook up for a race sometime soon, Dan! If you're ever in the Baltimore area, let me know! The group I run with also has a monopoly on runners at our pace, so there is never a shortage of people to run with. Jeff, I just read this report. Thanks very much for all the kind comments about Crazy 8s and Kingsport. We try to put on a world-class event and we're glad that it shows! Hope to see you back next year. Thanks, Hank. Great event! It's easy to write nice things when the event is truly superb. Cheers!